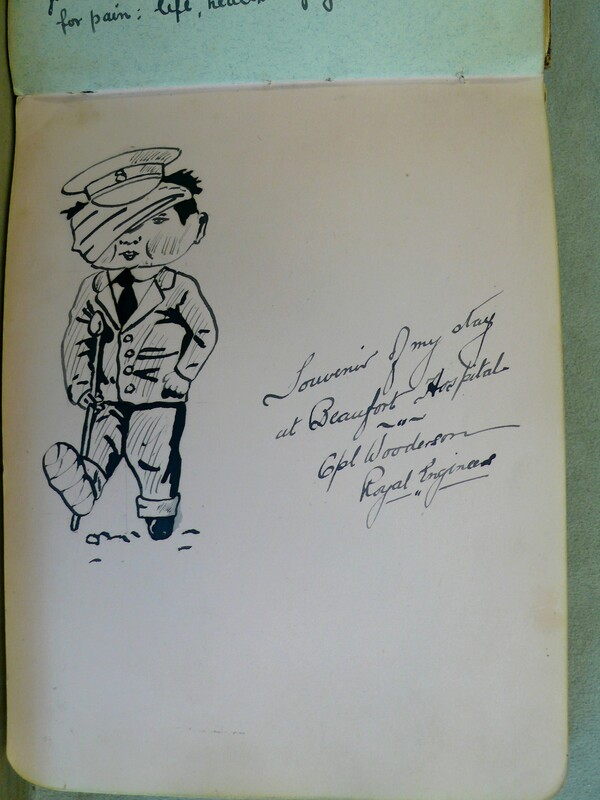 The Glenside Hospital Museum has two original autograph books in their Collection, and scanned copies of two others belonging to staff at the hospital. Soldiers and members of staff contributed comic rhymes and verses, quotes from favourite writers and poets including Shakespeare, Coleridge, Tennyson and Omar Khayyam. There are also drawings and water colours. 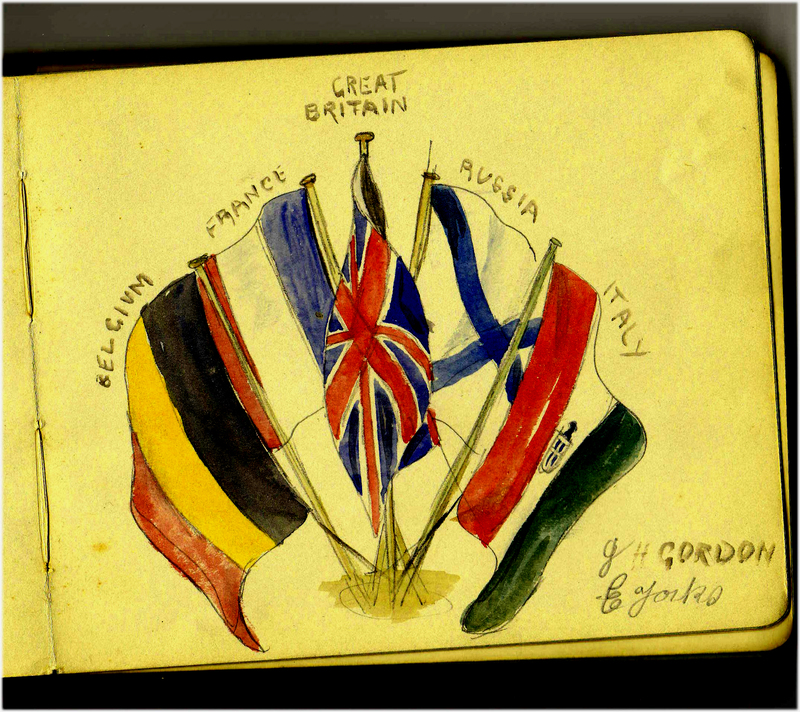 The autograph books are key to us finding the names of soldiers who had been to the hospital. Records of activities during the war on the home front were destroyed in the 1920s, and many Military Service Records were lost in the London Blitz during the WW2. Nor can we, like so many projects, look for names on grave stones, as out of the 29,000 patients only 164 died. Fortunately for us, many of the soldiers signed their autographs with their names, ranks, and even military numbers. This information has allowed us to search online for any records which remain. The autograph books of Sister Bertha Mary Williams. These are two books of autographs dating from 1903-1920. The originals are in The National Library of Australia. Miss Williams was one of the first four Queensland nurses selected for the Australian Army Nursing Service who left for Britain from Brisbane on 24th September 1914. Autographs include messages from English, Australia, Canadian, New Zealand and South African soldiers, reflecting the mix of nationalities who were treated at the hospital. We found Miss Witts’ autograph book in the archives of The British Red Cross in London. Miss Witts worked as a staff nurse and masseur in The First Birmingham Hospital and at The Beaufort from December 1916 until the end of the war. This book was donated to The Museum by Judy Cording, whose grandmother Lilly Annie Bagg was a laundress at The Beaufort. In 2016, we were given another autograph book by David Adams ditties and poems along with the signature and sometimes the date and regiment. The book belonged to ‘Aunty Mabel’, who was born to the sister of his great grandfather Charles Adams’s second wife in 1885. She married Arthur Smith, carpenter, in 1916 and died in 1969 having lived all her life at 69, Maple Road, Horfield, one of the houses his great grandfather Charles Adams built in Maple Road. We are not sure what role Mabel had at the hospital, but she collected some wonderful autographs and fun drawings in her book.